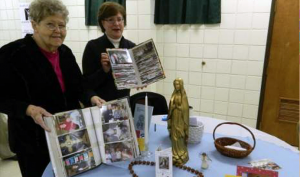 The Altar and Rosary Society consists of women who promote religious and social growth among their members by reciting the rosary at their meetings and at funerals of members when requested. They also raise monies to help defray the cost of wine, hosts, and linens used by the Church. Meetings are held at 6:30 pm on the last Tuesday of each month.